In my never ending quest to find ways to better understand the things that I do, I like to find new approaches and different formats to help me appreciate what I'm learning. For many people out there, a book with examples is great. For others, a website tutorial works well. For others, videos or screen casts are able to scratch that particular itch the best. Me? I tend to like them all, because each has their strengths and limitations, and each scratches my brain a little bit differently. So today's find, Ruby for Newbies, is brought to us by the folks over at Tuts+, an interesting source of a lot of tutorial content, screencasts and podcasts related to various technologies and areas of interest. The y have a listing of all their but the one's that fit my purposes today are a 13 part series dedicated to Ruby, which can be read as tutorials or watched as screen casts. The beauty of a screen cast is that you can rewind and watch as many times as you want. The series starts at the very beginning with installing Ruby on either Windows or a Mac, and then walks through several screen casts (each about a half hour long) to discuss various topics in Ruby and how to work with them. Note, there is a Premium service offered by Tuts+, but if you don't want to make that commitment, that's OK, Tuts+ offers a lot of content 100% free, including each of these screencasts (the source code can be downloaded by Premium members, so if that's a big deal to you, well, consider it :) ). The Ruby for Newbies tutorials are written and presented by Andrew Burgess (@andrew8088 on Twitter, happy to give him a plug here :) ) and provide good information directly at the level to help you understand the concepts. There's only so much that can be covered in 30 minutes, of course, so there's certainly limitations to the format. The ideas are covered in a rudimentary way, you will of course need to do considerably more playing around with it if you would like to get more in depth and understand the details better. The tutorial that follows also provides concise details and the specifics of what the screencast covers. Screen casts that I have personally found immediate value in were Ruby for Newbies: Testing Web Apps with Capybara and Cucumber and Ruby For Newbies: Testing with RSpec. I'm curious to see what more I can learn by looking over the earlier entries in the series. 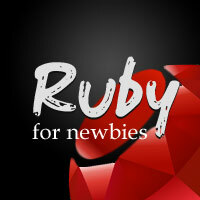 You may enjoy them as well, so if you are so inclined, give Ruby for Newbies a look. This is a great series! I'm always looking to learn more about Ruby. I'll have to check out the JS book they have and other tutorials. I was thinking about making a start on learning Ruby, so this post is great for me, as it gives me a good starting point.